ITAPARICA ISLAND with 240 km2 of vegetation and countless beaches, beautiful tropical flora and a rich cultural heritage is a highlight of many trips to Salvador. Until the introduction of the auto ferry in about 1974, isolated fishing villages lined the white beaches, planted with thousands of coconut palms. Now vacation homes occupy the stretches of beach between the fishing villages. The interior of the narrow island continues to be primarily uninhabited, as does the side of the island where the beach gives way to mangrove forests. Before decent roads to leading to the beaches north of Savador (coconut coast) were built, the wealthy from Salvador would maintain vacation retreats here. The island is a State county since Ju1y 30th 1962, comprising two villages: Itaparica and Vera Cruz. Some towns, such as Aratuba, Barra do Pote, Ponta de Areia and Mar Grande offer a good infrastructure of bars, restaurants and hostels. At Cacha Pregos, you can rent a small boat to go to Ponta dos Garcês and enjoy the beautiful Tororo waterfall. Ponta de Areia (Sandy Point) is a huge, wide beach close to the northern tip of the island, The side facing the ocean has a chain of coral reefs forming huge natural pools, great for bathing. • Cacha-Pregos fronting a village with boat building - swimming, coconut trees, boat rentals to visit nearby coastal wetlands with rivers, streams, mangroves, etc. Boats primarily travel 14 km between Mercado Modelo and Bom Despacho . Two “double-boats” (dose-dupla) can carry 90 small vehicles while the six conventional boats carry 60 small vehicles each. A special ferryboat has room for 170 small vehicles and has air conditioning, soft seats and attendants. The catamaran (fast boat) Morro de São Paulo takes 20 minutes and can be caught in many spots along Baía de Todos os Santos. The small boat ( pequena lancha travels between a launch near the Mercado Modelo and Mar Grande (Big Sea) is a small town with a nice beach scene and the drop off/ return point for the small boat. Terminal São Joaquim is close to the Feira de São Joaquim. Every day but Sundays and Holidays, for which no schedule is available. Tickets sold until 15 minutes before catamaran leaves. Boarding until 10 minutes before catamaran leaves. Taxis: while the big island has few roads the public transportation cannot generally be relied upon to get you to the boat on time. The largest navigable bay in Brazil is the beautiful bay on the Brazilian coast, All Saints' Bay covers an area of more than 1,000 square kilometers encompassing 56 islands. Many sources of fresh water flow into the bay, the most important of which are the Paraguaçu and the Subaé rivers. One of the best places for waters sports in the Americas, the largest offers excellent sailing conditions such as steady trade winds, average annual temperatures of 26°C, calm waters and a wide variety of sailing routes and historic sites, all surrounded by magnificent scenery. All Saints’ Bay is rich in natural life, scenic views and culture, In its 1100 square miles, 56 islands receive fresh waters from 21 rivers flowing into it and about 350 historical and cultural sites along its coast. It enchants all its visitors with its calm and clean waters, cool breezes and gentle currents, where the sun shines all through the year. because of the large number of tropical islands and warm beaches. It is known for its historical scenery composed by churches, fortresses, beautiful colonial townhouses and farms. The largest port in the Southern Hemisphere during the in the 16th 17th and 18th Century, Cachoeira and Salvador, are among the hemispere oldest and most importants ports. Located in the middle of the Brazilian coast, the bay was the safe port for the ships that came from Europe to Brazil or passed by on the way to Rio da Prata and India. Starting from the Portuguese coast, the sea currents and the winds brought the ships naturally to All Saints Bay. The marine commercial route to the East in the 16th, 17th, and 18th centuries was an eight month trip that outlined the south of Africa till the Canary Islands were reached. All Saints Bay, as an ideal place for construction and repair and restocking of the ships that traveled in those days. In the mid 20th century, the first Brazilian oil well was struck on the coast and today Brazil's largest refinery and petrochemical complex is located on the sea. Via Náutica (Sea Lane), is coming soon. Constructed to allow easier access to other visitor areas and the islands of the Bay, it will be 15 kilometers long with seven stopping places, going from Porto da Barra to Ribeira in its first phase with stops in Salvador, such as Pelourinho, Solar do Unhão, Ponta de Humaitá and Bonfim. a stunning tropical paradise where one can swim, snorkel, sun bathe, stroll along the sandy beaches, or purchase shells, coral, or other handicrafts made by local merchants. You will find towns that preserve a primitive atmosphere, where the people cultivate ancient habits of fishing and crafts. Ilha de Maré has enjoyable beaches and seaside villas. The three most populate towns are Santana, Itamoabo and Praia Grande. All three have nice beaches and beautiful landscapes. The beach called Praia das Neves also has calm waters and its natural vegetation adorns its sandy shores. Don't miss the island’s most significant cultural attraction, the church of Senhora Santana, from the 18th century, and Nossa Senhora das Neves, built in the 16th century. You will begin your boat trip by wading into the shallow waters to climb aboard. A short enjoyable trip where the warm climate is compensated by the cool island breezes. Located close to Salvador, 20 minutes by boat. by Itamoabo: Boats generally pull up to the praia (beach) of Itamoabo, and for lack of a pier one wade from waist-deep water to dry ground. by Boteiro : directly across from the Port of Aratú While this is home to Maré's only pier it will not provide easy access to the other two towns and beaches. It is one of the largest islands in All Saints’ Bay and also one of the most beautiful because of its exuberant flora, including Pau-Brasil. This island has a triangular shape, boarded by beautiful beaches. Its ecological reserve, Parque Florestal da Ilha dos Frades, became natural heritage in 1982. There are ruins of places where slaves were sold and bought, a "flour house" and two small churches: Nossa Senhora do Loreto and Nossa Senhora de Guadalupe. On Ponta de Nossa Senhora there are many huts which serve delicious traditional food, especially lobster. There are also other beautiful beaches such as: Loreto, Viração, Tobar and Praia da Costa. GETTING THERE: by car or bus, at Madre de Deus, then take rented boats to Paramana or Ponta de Nossa Senhora. The first Ecological Reserve in All Saints’ Bay, officially since 1991. Its vegetation is predominately made up of wetland and "restinga" – tropical trees. The island is involved in mysteries and legends, starting by its own name. Nowadays the Medo Island is still uninhabited, its only residents are wildcats. Time: Two hours. The crossing to the island takes from 10 to 30 minutes, depending on the boat. Tip: It is better to go at high tide because of the sand banks. How to get there: On boat, from Itaparica. It is an important town due to Petrobras seaport, from where there is a great view of Salvador. It is worth checking the architecture of the house of Pedro Gomes and Laudelino Pinheiro, at the Praia do Suape, and also the houses of Dois Leões and Antonio Balbino, all of them from the second half of the 19th century, as the Nossa Senhora Mãe de Deus Mother Church. The Maria Guarda island and Praia do Suape also belong to Madre de Deus island. GETTING THERE: by car or by bus, from Salvador Port Authority, 70 km from Salvador. There is a dense vegetation and villas surrounded by flowers. It is worth the trip if you disembark and walk down the streets, where there is much to see and to do. Basically, the population survives from fishing and carpentry industry. It is interesting to visit Solar dos Duartes, Nossa Senhora da Conceição Chapel and the fountains Rua, Porrãozinho and Grande. The island has two excellent beaches: Padre and Pontinha. GETTING THERE: by car or bus at Madre de Deus island, then take a rented boat. 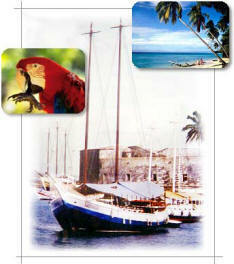 Situated between Madre de Deus island and Frades Island. Traveling by boat offers you a stupendous viewpoint of 19th century Bom Jesus dos Passos church. The island is now consolidating a marine ecotourism project in All Saints’ Bay. The project "Bimbarras Island" is an example of the preservation of Mata Atlântica, where men not only occupies it, but also restores and preserves it. The project works with sustainable development due to its low density of tourism activities, including a farm with agriculture and fishing activities. GETTING THERE: by boat or private sailing ship, 17 miles away from Salvador. GETTING THERE: by boat or private sailing boat. Located at the sea shore side of the ltaparica Island. Sailors and tourists can not miss the spot. Located in Southern All Saints’ Bay, with 5 km of coast, where the brookmeadows of Rio Jaguaribe and Lagoa dos Garcês are located. Its flora is composed by blue, red and yellow bromeliads, while the fauna shows wild species such as the "lobo-guara" and "porco-do-mato". GETTING THERE: by boat or private sailing ship. The area to the northwest and west of Salvador, inland from the banks of All Saints’ Bay, is known as the Recôncavo, a large rich and fertile zone that was one of the main centers for sugar and tobacco cultivation in the 16th century. In the 1950s, the area became Brazil’s major center for crude oil production. For centuries it has been an agricultural center, more lately for cultivation of spices, such as black pepper and cloves. Previously the interior of Bahia was primarily devoted to plantations of sugar cane, tobacco plants and cocoa. Here you'll find Rural Towns which have existed for several hundred years where inhabitants still ride horses and donkeys to the market, and live primarily off the land. Convent of the Ordem Terceira do Carmo, whose church has a richly ornamented interior. the Sisterhood of the Good Death Church. This church is the oldest (240 years) and the most important Afro-Bahian Woman's Organization in Brazil. Walk through the town’s picturesque streets and squares will reveal many other striking old buildings as well as nice shops for handicrafts in ceramics, leather and wood. São Felix Attractions: Across the river is the Danneman cigar factory that can be visited to see hand-rolling in progress. Yearly, on the first Friday before August 15th, its best known candomblé event is held: Festa de Nossa Senhora da Boa Morte (Our Lady of the Good Death Feast), to celebrate of the emancipation of slaves. For the event there are drummers and singers, as well as the dignified matriarchs of the sponsoring sisterhood. On the other side of the river in São Felix, on December 4th is held the second most important candomblé event, called Festa de Santa Barbara, dedicated not to the saint but to the goddess Iansã.